A federal air marshal is in quarantine in Houston today after being attacked last night by an unknown assailant at the Lagos, Nigeria airport wielding a syringe. U.S. law enforcement officials told ABC News they were alarmed by the bizarre, unprovoked attack because the assailant was apparently able to inject an unknown substance into the back of one of the air marshal’s arms. The air marshal was traveling with a team of other marshals when the attack took place in an unsecured area of the airport terminal in Lagos, the officials said. He was able to board the United Airlines flight to Houston he was scheduled to work and was met early this morning in Houston by FBI agents and health workers from the Centers for Disease Control (CDC). Health experts say most infectious agents would not immediately manifest or make the patient contagious. While the unknown assailant ran away and could not be located, officials said the other air marshals on the team were able to secure the needle and bring it on the flight for testing in the U.S.
U.S. air marshals travel undercover in plain clothes and it would not be immediately obvious to an attacker that his target was an American law enforcement agent, officials say. “While there is no immediate intelligence to confirm this was a targeted attack, this is our reminder that international cowards will attempt to take sneaky lethal shots at our honorable men and women abroad,” said Jon Adler, the national president of the Federal Law Enforcement Officers Association. 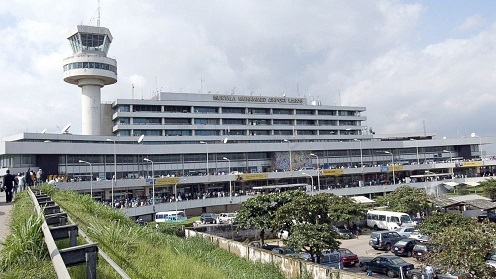 The Lagos airport has long been considered a possible target for the terror group Boko Haram which has conducted a series of deadly attacks across Nigeria. This is very sad to read. How could one imagine it that in broad daylight (not sure even if it is at night), a criminal could get away just like that at MMA after attacking somebody. What were the so-called securities officers at the airport doing? Where were they at the time of the crime? Whether it is Ebola Virus injection or it is the Boko Haram terrorist at work, is not the question at all. A crime is a crime and how could the criminal escape into thin air? I can remember some years back when late Prof Dora Akinnuli was championing the re-branding of Nigeria, how could that sort of goal be successful when there are some criminals lurking around the corner of the country at an international airport to debrand the country by committing crimes talk less of those outside it. Thanks, Fatai. A real national disgrace. What kind of danger lurks everywhere for Nigerians when a foreigner, in the confine of an international airport, could get attacked like that! And right at the entrance to the airport are security men who supposedly do not allow anybody inside without a passport AND a ticket.